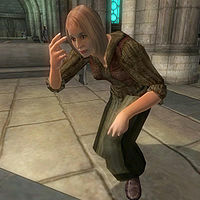 Lenka Valus is an Imperial commoner taking refuge in the Chapel of Akatosh in Kvatch. You will encounter Lenka for the first time during your search for Brother Martin, as she is one of the surviving Kvatch residents hiding out inside the Chapel. Restlessly sleeping on one of the available bedrolls, she wakes up at 10am and wanders around in the Chapel all day long, at times conversing with the other refugees. With nothing else to do in the besieged Chapel, she goes back to sleep at 8pm. Between midnight and 2am, Lenka may wake up and kneel repeatedly in front of the Altar of the Nine, then return to her bed. When you arrive at the Chapel with Savlian Matius, Lenka will, at his command, follow Tierra to the safe refugee camp south of the ruined city. Here, she will just wander around 24 hours a day without ever eating, nor sleeping. She wears a lower-class outfit consisting of a patched vest, breeches and a pair of stitched leather shoes. She also carries a small amount of gold. Like most of the other refugees, Lenka alternates despondency with hope. She will introduce herself by saying "I'm sorry. I don't think I'm going to be much help" and when asked about Kvatch will say either "Yes, I followed the priest here. I'll be safe here, won't I? They can't come on holy ground, can they?" or "The destruction was worse than I had feared. So many dead... it was almost better not knowing. Then at least I had hope." Lenka may appear next to the player after being released from prison. After spawning, she will immediately head for Kvatch. ? This page was last modified on 25 March 2018, at 03:00.